Ever Oasis is an action role-playing game developed by Grezzo, released for the Nintendo 3DS in June 2017. To promote the game, Nintendo will be releasing a series of short movies revolving around the game's world and story. Dive into a new take on the Adventure RPG genre in a brand new IP. Explore a savage desert, deep caves, and puzzle-filled dungeons. Forage materials to make products at shops, or synthesize equipment and items at your treehouse. Complete missions to recruit new villagers, each with their own shops, weapons and abilities, then bring them exploring/foraging. Earn dewadem, currency, over time as shops sell their wares to build new Bloom Booths. Battle wildlife that are possessed by Chaos and other enemies in real-time combat, while actively switching between party members. Immerse into a beautifully created world inspired by Egyptian culture/mythology. The desert's last safe haven is a lone oasis you call home. So draw a line in the sand and fight to protect it! As you explore the desert and solve puzzling dungeons, you'll gather resources to build up your oasis with the water spirit Esna. Allies will join your cause, so equip them with weapons, and use their skills to slay towering bosses. 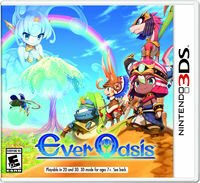 The Ever Oasis game is a new action-adventure RPG grown from the ground up by Koichi Ishii, creator of the Mana series and producer at GREZZO, the studio that rebuilt multiple The Legend of Zelda games for the Nintendo 3DS family of systems. Their team has crafted puzzles and traps too perilous for one hero to solve. So recruit a party of allies and level up their stats to learn new battle skills. Then return to your oasis and restore it: choose which shops to build, stock their inventories, collect a share of the profits, and keep villagers happy by fulfilling requests. Before long your oasis will blossom into a beacon of hope for all walks of life in the desert. Don't let them down. The story of Ever Oasis revolves around Tethu, a young Seedling whose home lies within the last safe haven in the desert, a lone oasis. It is Tethu's job to work with the water spirit Esna to build up the oasis and defend it from monsters. 1.1 June 23, 2017 88 blocks Gameplay adjustments. ↑ Nintendo Direct 4.12.2017. Nintendo (YouTube; April 12, 2017). Retrieved April 12, 2017. ↑ Nintendo Direct 2017.4.13 プレゼンテーション映像. Nintendo 公式チャンネル (YouTube; April 12, 2017). Retrieved April 12, 2017. ↑ Nintendo Direct - 12.04.2017. Nintendo UK (YouTube; April 12, 2017). Retrieved April 12, 2017. ↑ "Work with Water Spirit Esna to defend the world’s last Oasis in Ever Oasis, releasing June 24 on #3DS. "Nintendo AU NZ on Twitter (April 12, 2017). Retrieved April 12, 2017. ↑ Ever Oasis on Nintendo of Korea's website. Retrieved June 26, 2017. ↑ Daily Briefs (Apr. 18): EU boxarts / Sonic Mania / Sonic Forces / Samus figma (MP3 ver.). Perfectly Nintendo (April 18, 2017). Retrieved April 18, 2017. This page was last edited on 16 January 2018, at 19:40.